located by the Pura Anyar Temple on Saba Beach. 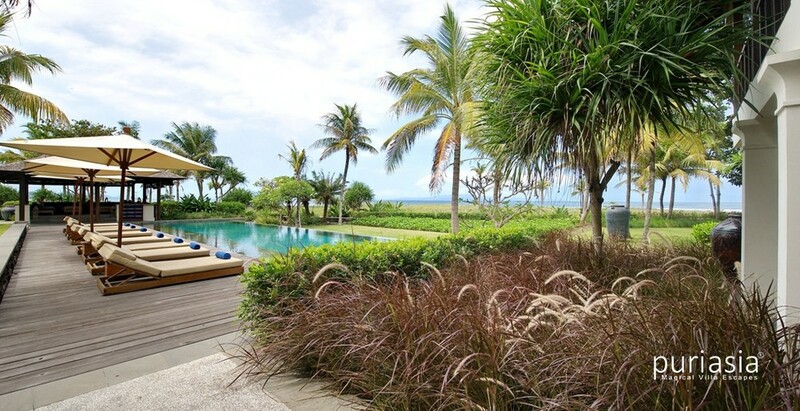 The House and gardens command uninterrupted views of Bali’s dramatic East Coast, Gunung Agung and the Nusa Penida Islands. From the Pura Anyar temple to the traditional sea side dining bale, at Jeeva Saba Villa you are surrounded by the spirit of Bali. 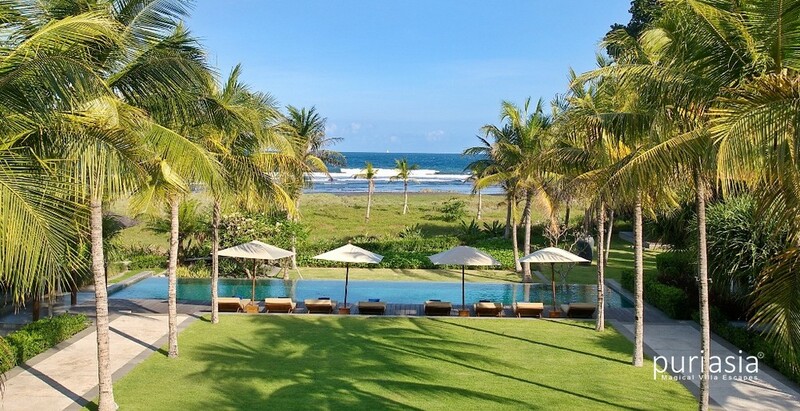 Jeeva Saba Villa consists of three separate living pavilions arranged around the terraced beach side lawn and over-sized infinity swimming pool. 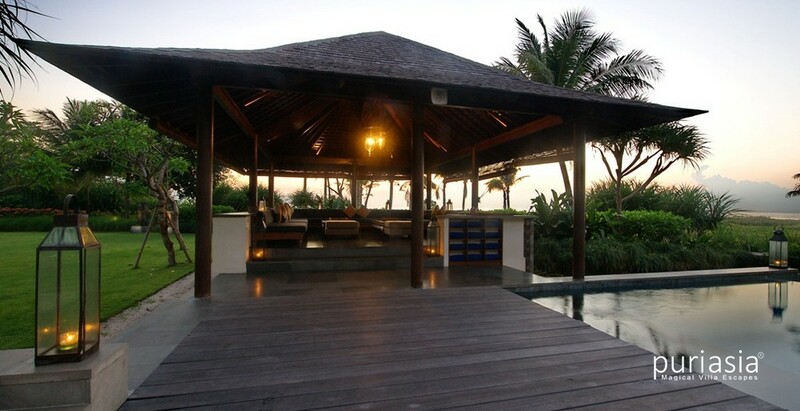 All pavilions have a direct view of the Indian Ocean. The house has been built with recycled materials including nearly four meters high doors from a demolished school in Surabaya and roof tiles from an Old Dutch military compound in Bandung. 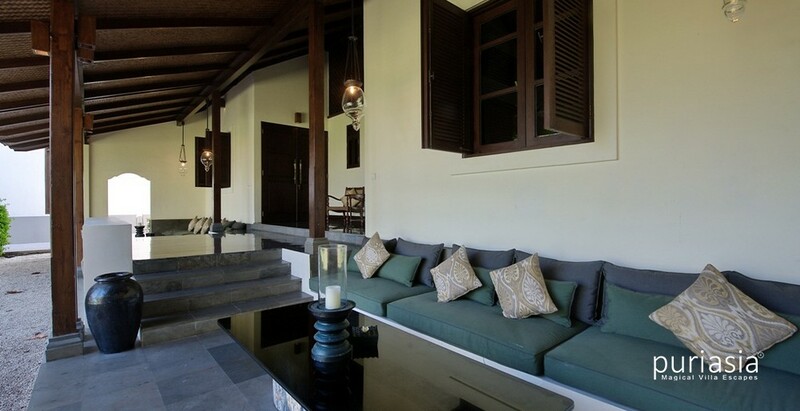 Jeeva Saba Villa is furnished in a mix of Asian, colonial and modern styles that reflect the architectural design of Jeeva Saba Villa and the mixture of cultures that define Indonesia. Jeeva Saba Villa is approximately 15 minutes from the beach town of Sanur and 30 minutes from the Balinese cultural center of Ubud with its many fine restaurants and events. 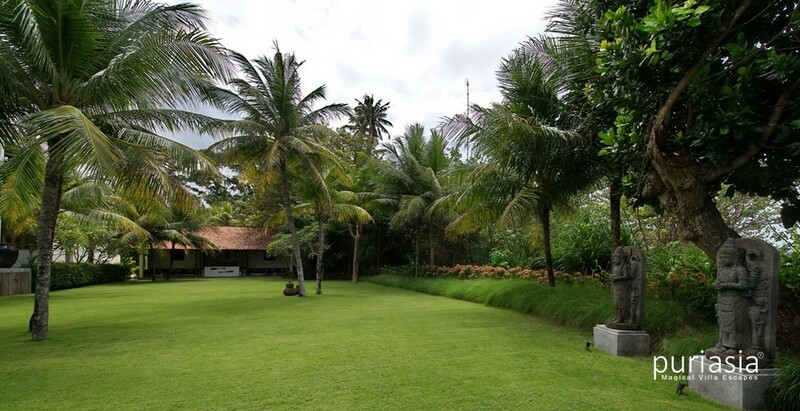 Horseback riding and Keramas surfing beach are within walking distance of Jeeva Saba Villa. Jeeva Saba Villa facilities include eight ensuite king size bedrooms, a media room, a billiard room, a massage room, a gym ,seaside open air living bale and separate dining table bale with butler’s kitchen, a formal dining room and separate hotel style professional kitchen. 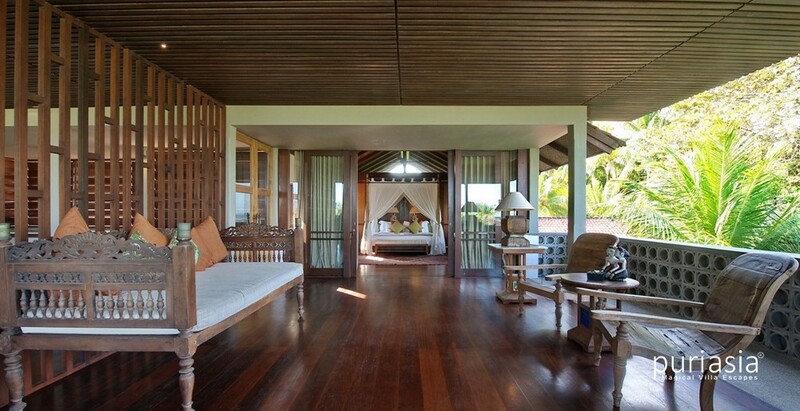 The eight ensuite bedrooms at Jeeva Saba Bali Estate are located in the Tree House, the Beach House, or the Coast House. 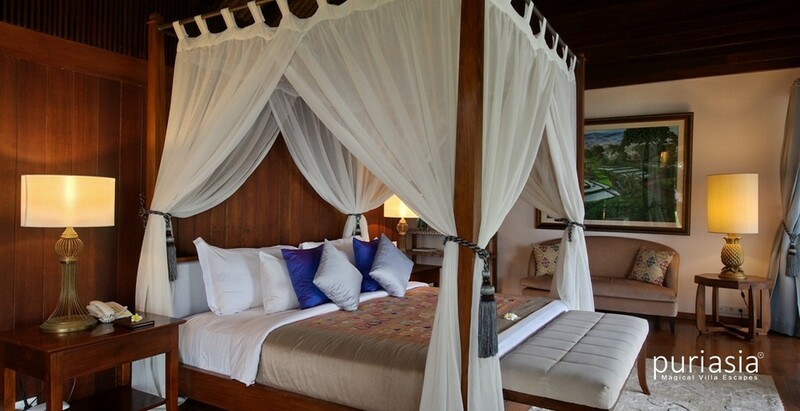 All bedrooms have luxurious king-size four poster beds hand carved by Indonesian artisans and are fully air-conditioned. 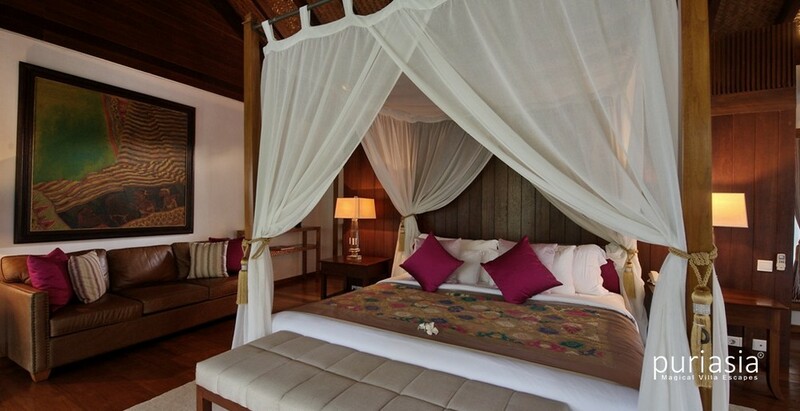 Bedding and amenities are of the same fine quality that marks Jeeva Resorts. 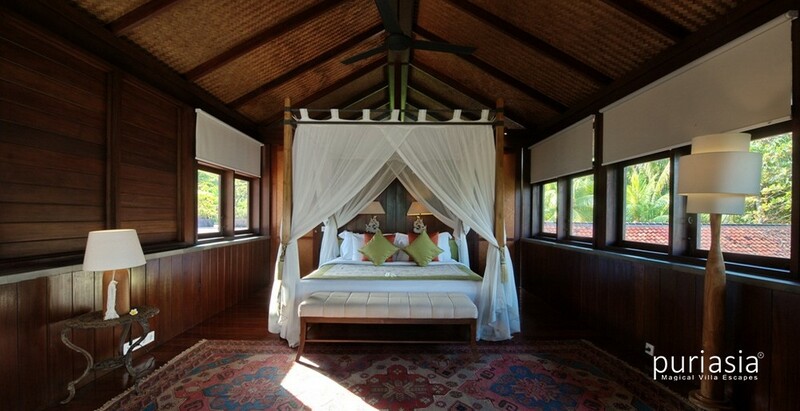 The Tree House is the smallest of the pavilions and consists of a large master bedroom suite and a separate studio bedroom suite with high wood and bamboo ceilings. Both suites have separate terraces with long relaxing sofas that face the ocean. Both the master and studio suites have a seating area that can be converted to comfortably sleep two children. 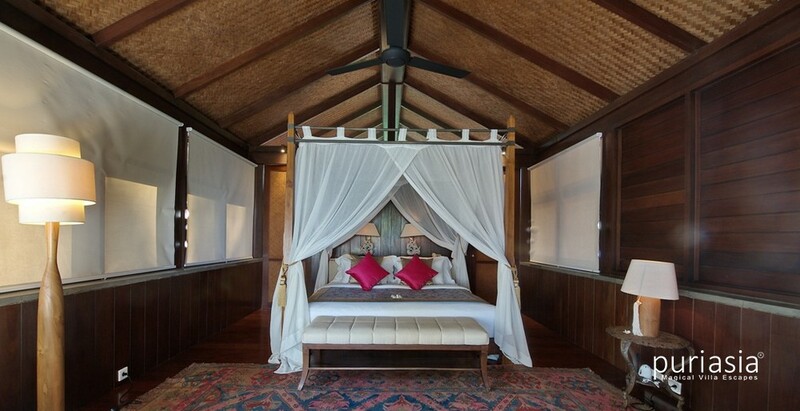 The master suite has a large private enclosed courtyard, a semi-outdoor shower and bath, and contains an antique Madura four-poster carved bed. 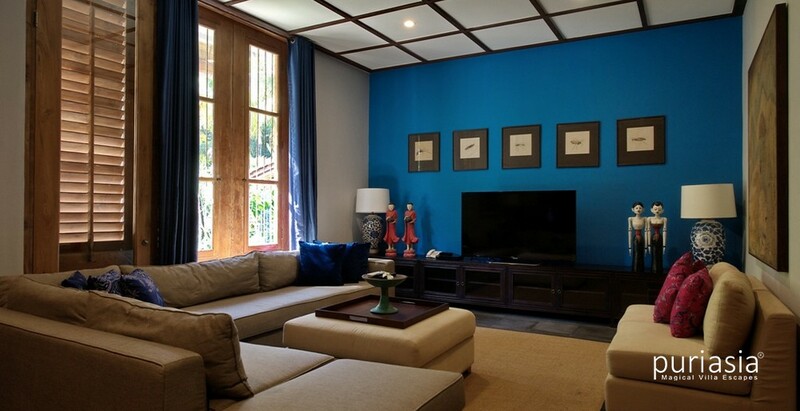 Both the master and studio suites have flat screen televisions. 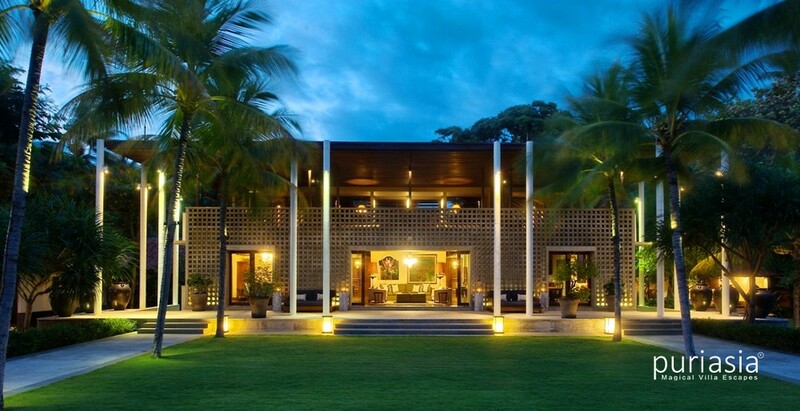 The two-story Beach House is at the center of Jeeva Saba and is the largest pavilion in the estate. The two master suite bedrooms are on the upstairs floor of the Beach House with large terraces and daybeds that offer unparalleled views of the ocean, islands and mountains. 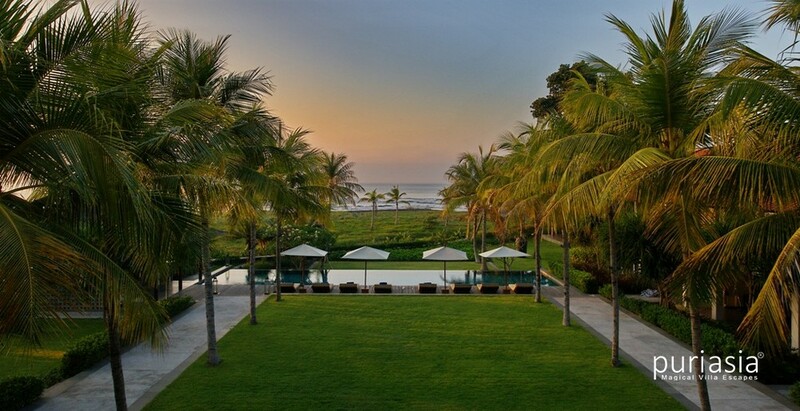 The views from the master suites in the Beach House may be amongst the most dramatic views in Bali. The two master suites in the Beach House are identical and flank the interior courtyard. Both suites have high pitched ceilings in the traditional Balinese style with a wall of windows that offer views of either the beach or rice paddies. The wood and marble double sink bathrooms have both indoor and outdoor showers and large outdoor bath tubs set on a private terrace. 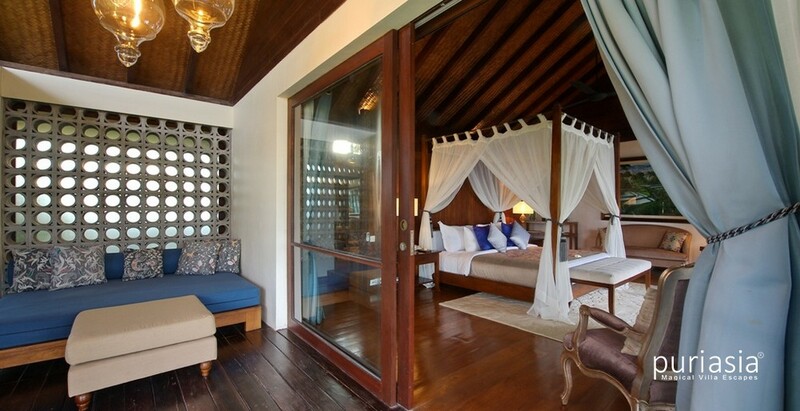 The Beach House suites are furnished in a luxurious, yet simple style, that exudes an air of elegance and romance. The Coast House overlooks the beach, the seaside lawn and infinity pool, and up the coast to Mount Agung and the mountains of East Bali. The rear of the Coast House looks out over rice paddies. The Coast House features four ensuite master bedrooms: two upstairs and two downstairs. 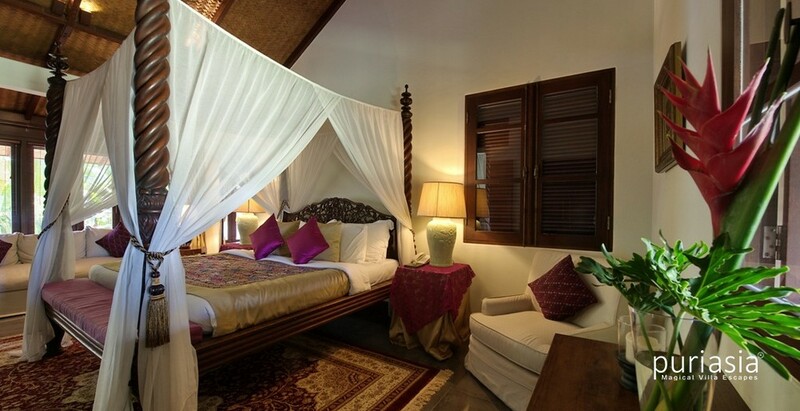 The two upstairs suite rooms have two full glass walls with direct views of the ocean and the mountains of eastern Bali. The upstairs suites have large private terraces and extra large bath and dressing rooms with double sinks, high pitched ceilings and open air bath tubs and showers. The downstairs bedrooms consist of one suite room and a junior suite room. The suite bedroom has direct ocean views, a private terrace, a flat screen television and a double sink bathroom with a semi-outdoor shower and bathtub. The junior suite bedroom has views of the ocean and pool, and a flat screen television. This bedroom can be converted to a children’s bunk room. 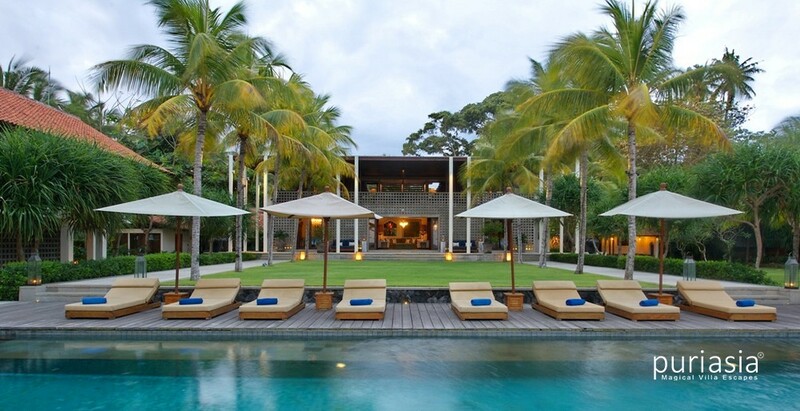 Life at Jeeva Saba revolves around the 25-meter infinity pool, the bales, or the Beach House with its air-conditioned media room, game room, massage room and living and dining rooms. Most living is outdoors with breakfast and lunch in the dining bale and the day spent either on a lounger by the pool, on the beach, or on one of the oversized daybeds in the large relaxing bale. With private terraces off all the ensuite rooms and a large pool and deck area, there are various options for spending time together as a group or in the privacy of a guest’s own personal space. 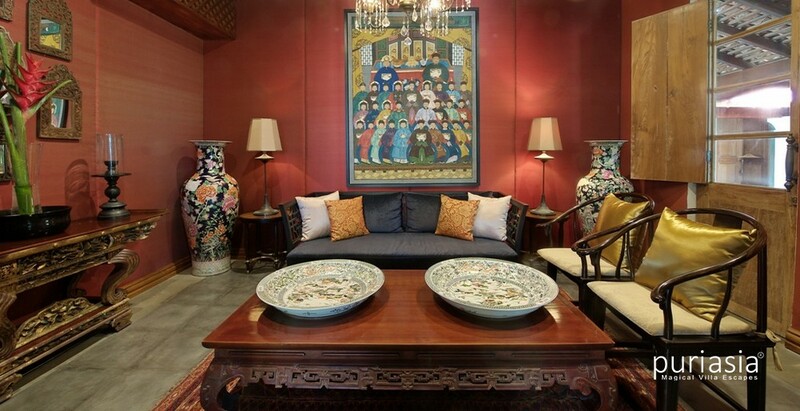 The Beach House is furnished with an eclectic collection of antiques, paintings and comfortable modern furniture. 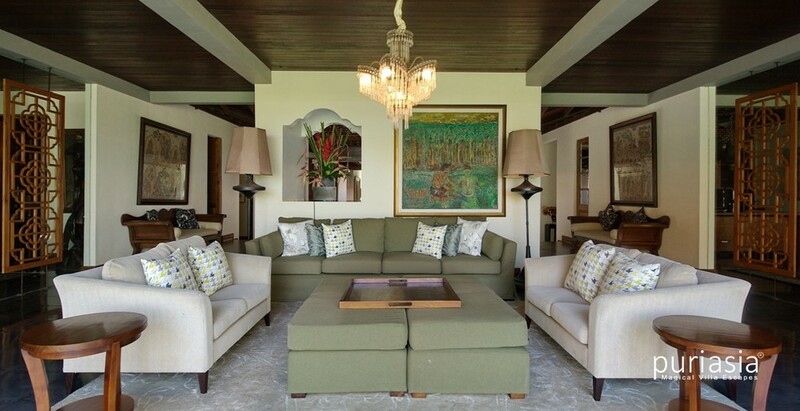 Living areas flow into one another with the principal living rooms separated by glass walls and antique doors. The gym is equipped with a treadmill, cross trainer and free weights. Massages can be arranged in the single person massage room or on the private terraces. 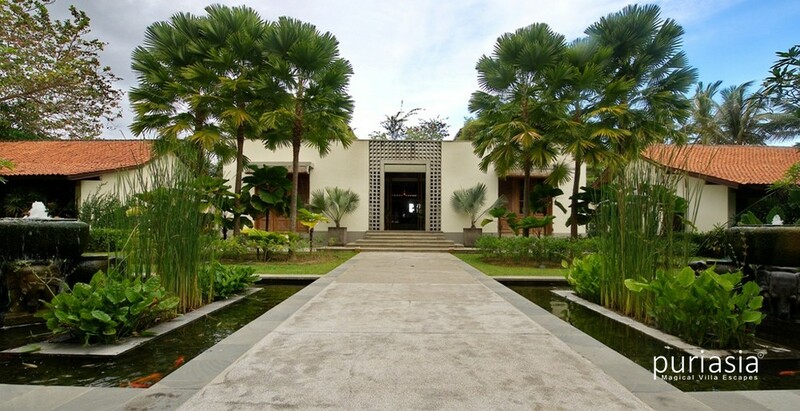 The ancient Banyan tree and Pura Anyar Temple at the estate entrance are unique to Jeeva Saba and mark Jeeva Saba as a true Bali destination. It is possible to host certain events within the temple itself with permission based upon application. The Banyan tree and Temple are extremely special and enhance the overall tranquil atmosphere at Jeeva Saba as a spiritual and unique location for a destination wedding. Take advantage of our two large beachfront lawns that can seat up to 250 people comfortably and 400 for cocktails. The design of the house, with a variety of different types of spaces and pavilions, allows guests to host large or smaller more intimate events without sacrificing comfort. 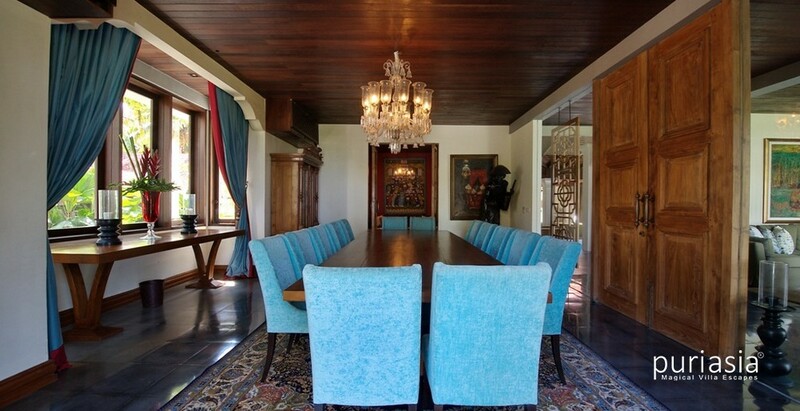 The formal dining room seats up to 20 people while the upstairs covered terrace is ideal for larger dinners or a cocktail event while maintaining a degree of intimacy. 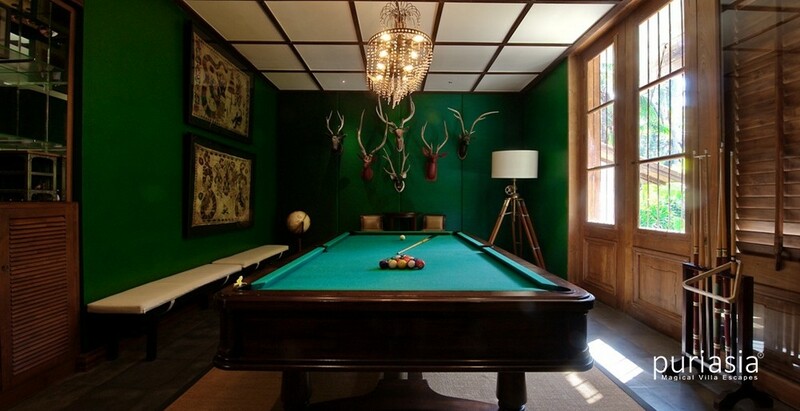 The different rooms and garden areas provide a high degree of flexibility in meeting any group’s requirements. Our experienced staff will work with you to arrange professional wedding and event organizers, florists, designers and caterers to help you plan your special event. In-house menu is available in the dining room and the dining bale. Complimentary breakfast served daily. A full European/American style breakfast is included as part of a stay at Jeeva Saba. An Asian style breakfast can be arranged upon request.Lunch and dinner at Jeeva Saba are prepared by guests’ request. Jeeva Saba offers an a la carte menu at set prices for a variety of Western or Asian lunch and dinner dishes. There is also a list of select bottles of wine that Jeeva Saba maintains in stock. Lunch and dinner menus are ordered in advance with your Butler. Our chef is very happy to schedule cooking classes for our guests. Barbecue facilities are available. If you’d like to self-cater, that’s also possible. It’s your time, your holiday, we’ll be there as much, or as little, as you like. A seven-seater car and driver for up to 8 hours a day (excluding petrol). For Sanur and Ubud area only. Additional time is charged at us$10 per hour. *Rates above are subject to 21 percent tax and service charge. Kindly note the above rates are valid until 31 Jan 2018. Please email us if you would like to make a booking after this date.